Space-naval combat returns in Battlefleet Gothic: Armada 2, the highly-anticipated sequel from Tindalos Interactive and Focus Home Interactive, improving on every facet of the first game to make a bigger, better experience for admirals everywhere, and an even greater adaptation of the original board game set in the Warhammer 40,000 universe. Today’s Battle Overview Part 1 video is the first in a two-part series that will teach you the huge number of options at your disposal in Battlefleet Gothic: Armada 2. Get everything you need to know ahead of the first beta phase, scheduled from December 5 to December 12. With more factions and more ships come bigger battles, with larger fleets clashing to control the Eye of Terror and the surrounding region of space dubbed the Aegis Ocularis. All twelve factions from the tabletop game are now represented, and each has unique ships, new mechanics, and much more to show off. Be it unique ways of moving through space or weird, alien weaponry and ships, each faction feels distinct from its peers. Even those that share similarities such as the Aeldari Corsairs and Asuryani Craftworlds or the Tau Protectorate Fleet and Merchant Fleet have differences in what they can field. This makes your faction selection, and choice of ships, armaments, admiral skills, and fleet upgrades totally customisable and massively impactful. In the trailer you’ll see how all this combines with the layout of maps, capture points, the enemy fleet, and the various phases of battle to create a challenging and spectacular simulation of space combat. Prioritise targeting weapons or engines, kill crews with boarding actions to turn enemy ships into floating hulks, or go all out on ramming enemy ships and committing to close-quarters battles. Battlefleet Gothic: Armada 2 releases January 24, 2019, on PC. Pre-orders receive a 10% discount ahead of launch, 25% if they own the original Battlefleet Gothic: Armada. Beta testing begins in early December for all pre-orders. Battlefleet Gothic: Armada 2. Copyright © Games Workshop Limited 2019. Battlefleet Gothic: Armada, the Battlefleet Gothic: Armada logo, Battlefleet Gothic, the Battlefleet Gothic logo, GW, Games Workshop, Space Marine, 40K, Warhammer, Warhammer 40,000, 40,000, the ‘Aquila’ Double-headed Eagle logo, and all associated logos, illustrations, images, names, creatures, races, vehicles, locations, weapons, characters, and the distinctive likeness thereof, are either ® or TM, and/or © Games Workshop Limited, variably registered around the world, and used under licence. 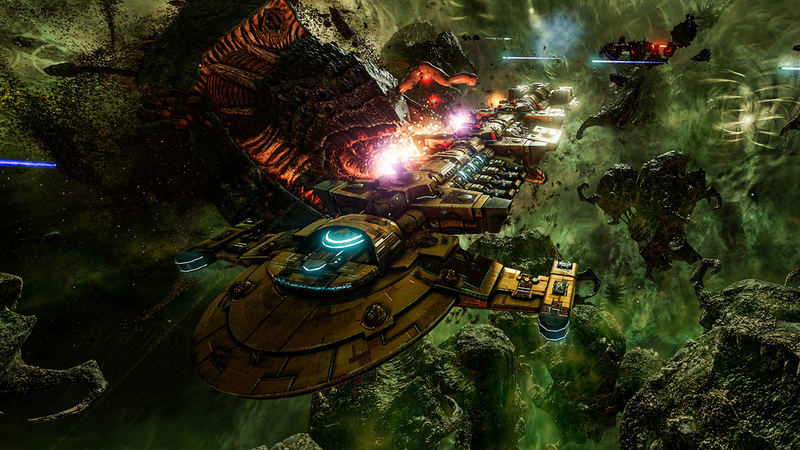 Battlefleet Gothic: Armada 2, developed by Tindalos Interactive, published by Focus Home Interactive. All rights reserved to their respective owners.